NOTES: US Army 2 ½ ton truck in French Firefighter service. Built by GMC, the US Army’s CCKW 2.5 ton truck was one of the logistical linchpins in the Allied war effort in WW2. This truck was another of those unheralded, key contributors— such as the C-47, the Liberty Ship, the DUWK, and the Jeep. The CCKW truck was considered a 6x6 truck, with all six wheels powered. The truck was powered by a 4.4 litre, 6 cylinder inline gas engine, putting out 104 hp. What puzzles me a little is the fact that the rear wheels are actually doubled up, so there are four per side. Somehow, the army still considered this a 6 wheel truck, and not a 10 wheel truck….? Nicknamed the “Deuce and a half”, the CCKW truck was produced in both a short and long-wheelbase version, in great quantities. It is not clear which version of the truck the kit represents. I believe this kit was based on the Heller kit of a standard US Army 2.5 ton truck. The kit consists of about 180 parts. This is definitely a builders’ kit—everything is built up. For example the frame, instead of being molded as one ladder-like piece, is made of a number of longitudinals and cross braces. There is a full engine and transmission. Eight pieces make up the suspension for the rear wheels on each side. The front end sheet metal has the sides, front, and hood, all molded individually. The kit includes decals and painting instructions to do one vehicle. The instructions say that it is from the “Sapeurs Pompiers”, from Province Cote d’Azur in 1995. The decal sheet includes some small marking s for the truck, plus a large crest for the hood. The decals look like they’re pretty thin, and are printed in register. The color scheme for the truck has a grey chassis with red body- which explains why the model was molded in these colors. I have no interest in building a commercial truck kit- with all the chrome that you find on the cab of your typical 18 wheeler. Likewise, a glossy red and chrome fire truck doesn’t really appeal to me either. This kit allows me to build a vehicle that I can weather and enter in a heavy truck or emergency vehicle class, as appropriate. I was thinking that this truck would look nice with olive drab showing through places where the red paint has been worn away. I’ve posted on some of the armor discussion forums for feedback on these Heller 2.5 ton truck kits—the feedback I’ve gotten is that the kit is OK- provided you are careful with the alignment of the chassis. Word seems to be that if you are careful with the alignment of the frame parts, the body will go together without much trouble. 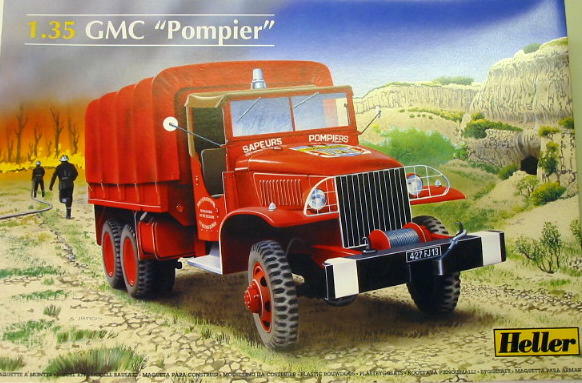 A quick web search didn‘t turn up much on the truck- all I was able to confirm is that Pompier is French for Fireman. There is, however, a lot of information available about the standard US Army version of the truck.